Select the last slide in your presentation. Starting at the end makes sure the template sticks to the whole presentation. Open the New Slide drop-down list. On the Home tab, open the drop-down menu on the New Slide button and choose Reuse Slides. 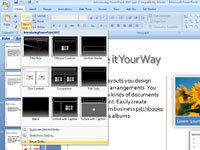 The Reuse Slides task pane appears. Find the presentation to use. Click the Browse button and choose Browse File on the drop-down list. Open the presentation to use. 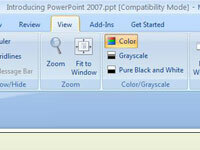 Locate and select the presentation with the template you want; then click the Open button. 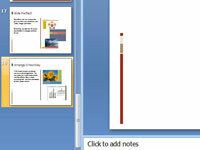 Slides from the presentation appear in the Reuse Slides task pane. 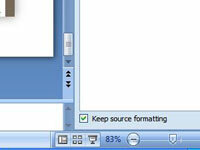 Choose to keep the source formatting. 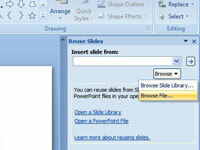 Click the Keep Source Formatting check box at the bottom of the Reuse Slides task pane. Insert all the slides from the presentation. 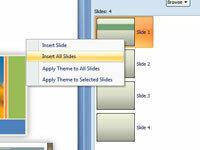 Right-click a slide in the task pane and choose Insert All Slides on the shortcut menu. 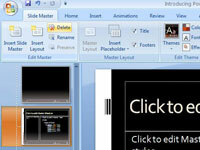 All slides from the other presentation arrive in your presentation with their formatting intact. Open the Master Slide view. Click the Slide Master button. 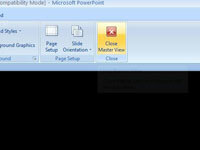 Scroll to the top of the Slides pane, right-click the first slide (the Slide Master), and choose Delete Master on the shortcut menu. 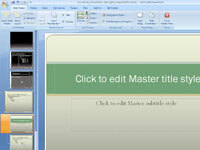 All the slides take on the formatting of the new Slide Master. Close the Slide Master view.